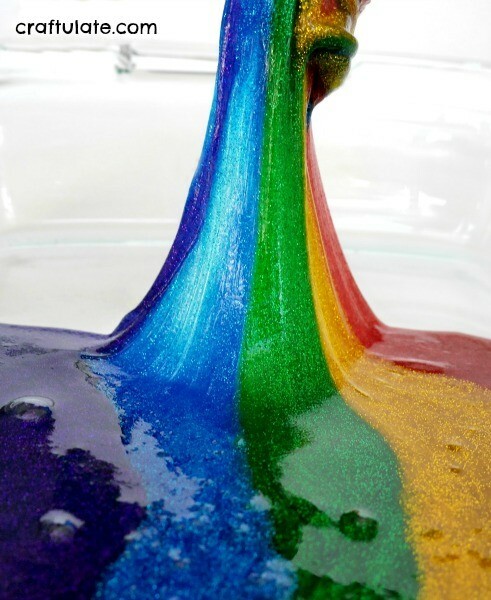 This rainbow slime is such an amazing play recipe, and the glitter added a super-sparkly effect too! What’s better than making your own slime? Making slime in lots of different colours. And what’s better than making slime in lots of different colours? 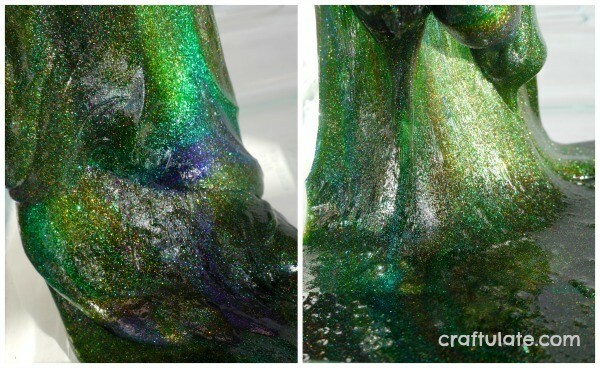 Making SPARKLY slime in RAINBOW colours!! To make the slime, I placed the glue into a bowl, stirred in some gel to the correct color, then added the liquid starch until the mixture held together but was no longer sticky. Then I added one of the glitter packets and stirred it into the slime. For a full tutorial on making slime (non sparkly version), see my video from when I made Halloween Slime. Note: The yellow slime I made came out a little bit too orange, so I have to confess that I don’t have an exact rainbow of slime. Oh, and I didn’t make indigo. Please forgive me. 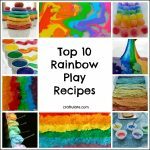 Once I had (nearly) all the colors of the rainbow, I laid them out in a glass baking dish in long strips to form a rainbow shape. The slime looked pretty cool! I showed it to F and I picked it up at one end to show him that the rainbow was made from slime. I have to confess, it looked STUNNING! Those bright colors and all that glitter? Mesmerizing. After that we sort of had half a rainbow, and a puddle of crazy color! I asked him whether he wanted to try lifting up the slime and he said that he needed his tongs! And don’t be mistaken in thinking that once all the different colors had merged together this activity was over – the slime still looked FANTASTIC! After we’d left the slime for a while it took on a dark green tone, and was still so beautiful that I just had to take some more pics. As this slime will keep I can’t wait to get it out and play with it again! However – important note – do NOT discard the slime down your sink! The best idea is to put it in a plastic bag and throw it out with the regular garbage. Very cool! I love all the colors! Gorgeous colours – I really can’t wait to get some liquid starch and give slime a try roll on US trip in the summer. 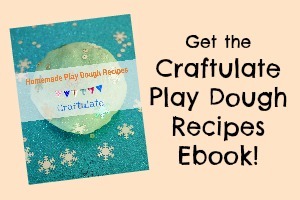 The more I look around your blog, the more embarrassed I am I wrote I was a ‘craft mum’ …Haha! Well well.